Can’t wait for summer to unfold? Check out Ranken’s Summer Adventure Academies for rising middle and high school students! Students get fun, hands-on experiences with technology, and learn about career paths in technical industries. The academies are held in July at Ranken’s St. Louis, Wentzville and Perryville locations. Each program encourages students to design, create, think and work through hands-on activities. Over the course of their program, students complete a project and often get to take home their unique creations. Online registration will open on Friday, March 1, 2019 at or about 9:00 AM. For more information, contact: Barbara Bragg at [email protected] or (314) 286-4822. The Summer Adventure Academy program encourages middle and high school students to complete high school and further their education in a STEM-related discipline and ultimately join the technical workforce in their community by earning a STEM degree. These week-long summer camps promote STEM career exploration by providing outside the classroom educational experiences to raise students’ aspirations. The Summer Adventure Academies engage students in real-world, hands-on camps that demonstrate the skills necessary in STEM occupations. More than 2,000 students have participated in the program since 2010. Local secondary school teachers who teach STEM subjects in their classrooms often co-teach the academies alongside a Ranken faculty member or industry expert trained in a correlating field. This paid opportunity informs educators about technical occupations and the educational requirements necessary to obtain rewarding STEM careers. They carry beneficial information back to their classrooms to share with their students. More than 115 secondary teachers have taken advantage of this opportunity since 2012. No scholarships are currently available. Summer camps designed specifically for middle school and high school aged Boy Scouts. Participants will have the opportunity to work with college instructors to earn the Architecture, Auto Maintenance, and Welding Merit Badges while enjoying the college experience, to include hands-on activities in state-of-the-arts labs and dining in the college café. We encourage troop leaders and parents to volunteer as mentors in any of our Boy Scout camps. Please register as a volunteer today. All A-Bot Robots – Robots may be the future of technology, and they are definitely fun to make and program! Students will develop their engineering and technology skills using NXT robots, gears, motors, and sensors while building a robot to maneuver through an obstacle course. Advanced Robotics – Designed for students who have prior robotics experience through Ranken’s All A-Bot Robots camp or participation on an FLL team. Campers will design & build robotic accessories (arms, grippers, etc.) using the TETRIX Prime building set, and control autonomous robots by remote control. Aviation Technology – Students will get an introduction to aircraft maintenance, the joys of flight, and what it takes to keep ‘em flying. We’ll explore careers available to aviators, experience the thrill of flying in an actual airplane, build & launch model rockets, fly balsa gliders, and have fun team building! Design and Engineering – Campers will learn manufacturing processes from blueprints and design to prototype production and quality control. Explore how your idea can come to life with Mastercam and SOLIDWORKS software. Experience state-of-the-art Computerized Numerical Control (CNC) machines. Heavy Metals – Use raw metal to create your own designs! Students will learn the fundamentals of welding, from simple techniques to more complex ones. Students will design and fabricate their own metal masterpiece. Summer Racers – Want to know how a real race team works? Our summer racers will build their own car, practice team building skills, and learn about automotive careers. 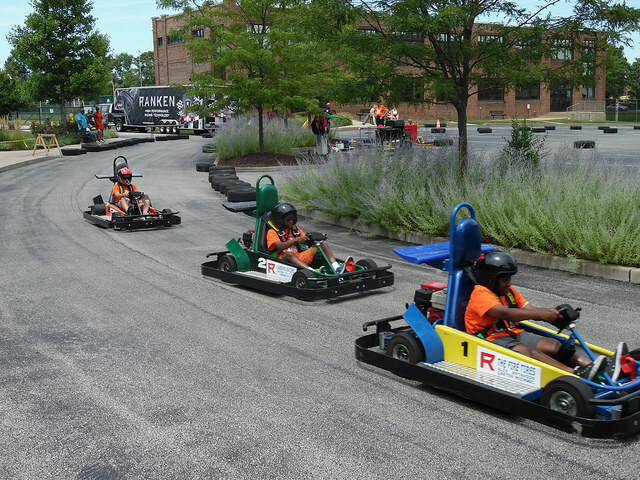 Students will learn how a go-kart works, how to use tools, how pit stops win a race, and how to drive a real go-kart safely! Wood Works – Design it and build it! Students will construct their own project from start to finish using a variety of woodworking and power tools. This program will familiarize students with fundamental construction techniques, shop and safety skills, and provide them with fun, constructive entertainment. Rolling Robots – Learn coding with fun activities using Sphero, the round robot. Create programs to guide Sphero through challenging obstacle courses and routines utilizing tablet technology. Find your future in programming and app development in this unique camp. Airbrushing Paint FX – Brighten up a dull summer at our custom automotive painting and airbrushing camp! Students will learn popular airbrushing techniques, starting with basic hands-on airbrush exercises. Whether it’s on the hood of a car, or a canvas, this camp lets you channel your inner artist. Boot-Up Computer Camp – Students will learn about the latest computers and operating systems, how they work and how to apply that knowledge into a real-world networking environment. Working both individually and in small groups, students will complete hands-on class projects. Design and Engineering – Campers will learn manufacturing processes from blueprints and design to prototype production and quality control. Explore how your idea can come to life with Mastercam and SOLIDWORKS software. Use state-of-the-art Computerized Numerical Control (CNC) machines and 3D printing. EV3 Robotics & Racing @ the Academy of Racing – Students race electric-powered racing karts learning basic principles like acceleration, braking, & race craft in the morning. After lunch, campers will work with LEGO MINDSTORMS Education EV3, building, programming, and testing real-life robotics technology. TETRIX Robotics Technology – Build your own robot and apply engineering design principles while expanding your technical building and logical thinking skills. Learn programming design and how input/output devices can affect the behavior of a robot. A robotic challenge will test your skills. Remote Control Race Engineering – Students model a motorsports team while working to optimize the performance of a FastTrack RC (remote control) Car through inspection and modifications. Take the challenge! Women in Engineering – Experience the fun and excitement of solving engineering challenges on a team of like-minded young women. Discover how you can use your unique talents to find satisfaction in engineering. Drone Aerial Systems – You’ve heard all about them, now learn to fly one. Yes, learn to fly and video record with one of today’s hottest hobbies. In this camp you will learn practical real world uses for drones. Learn to fly through an obstacle course and video record your own flight on the Ranken campus. FANUC Robotics Technology – This camp will explore how a six-axis robot operates and how to program a FANUC robot to perform basic functions, including use of pneumatic grippers. A capstone project will illustrate each student’s experience. Think Like an Entrepreneur – Spark your creativity and learn how to bring your ideas to life. Explore the skills and virtues necessary to be a successful entrepreneur and innovator. Participate in a team-based, hands-on innovation challenge culminating in a Shark Tank-like pitch. Exploring Cybersecurity! – In partnership with the Midwest Cyber Center, you’ll learn about cybersecurity career opportunities, how you can make a difference in this field, cyber ethics, online safety, how computers work and cyber threats all through hands-on activities. The last day you’ll test your knowledge with a mini competition. Snacks but no meal will be provided. For a full week of fun! Includes lunch, snacks, tools, equipment and fun projects with experienced instructors! This material is based upon work supported by the National Science Foundation under Grant No. 1104090. Any opinions, findings, and conclusions or recommendations expressed in this material are those of the author(s) and do not necessarily reflect the views of the National Science Foundation.